Every country has its strange beliefs. A goodly number of Americans are convinced public health insurance is a Commie plot, many Japanese believe keeping a toy cat somewhere in their home is lucky, and the Scottish think haggis is food. 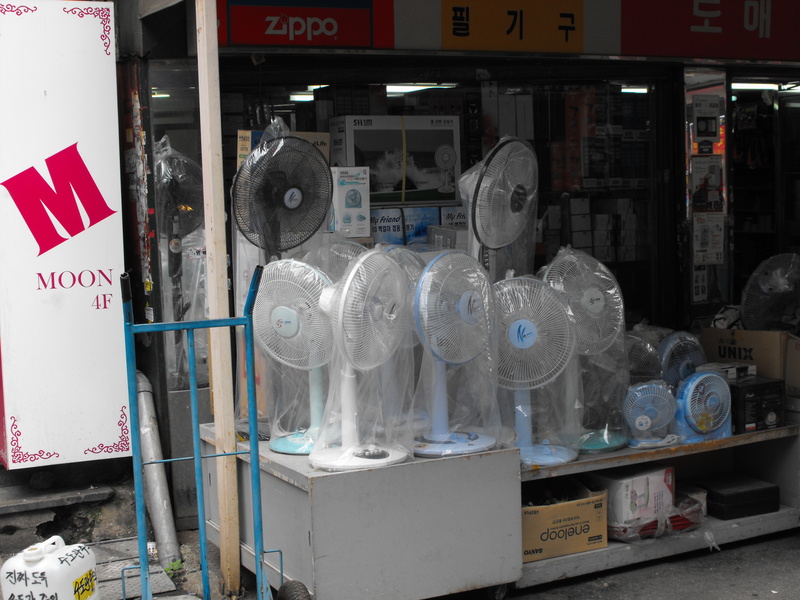 Here in South Korea, a lot of folks believe in something called fan death. When I was teaching ESL back in Vancouver, I heard a lot about fan death. Basically, what many Koreans believe is that letting an electric fan run all night in a closed room can kill the people sleeping inside. This is why the electric fans here have timers that turn off these dangerous appliances automatically. People are very strongly encouraged to make sure they are set before going to sleep. Any time the topic of fan death would come up with my students, I tried to get them to explain to me how exactly an electric fan in a closed room could kill you while you slept. Some interesting explanations were offered. One theory is that keeping an electric fan on all night in a room with the door and windows closed can lead to suffocation. When asked how, students would explain that people suffocate because the fans move air away from them. When I pointed out that a fan moves as much air in your direction as it pushes away, they usually looked somewhat taken aback. Another theory I heard often is that electric fans give off carbon dioxide, which builds up to deadly levels in a closed room. Well, I see two problems with this one. First of all, you would need an airtight room for this to work. Then there is the fact that electric fans do not run on fuel and so do not produce carbon dioxide when in operation. Undeterred, some of my more creative and ardently committed students moved on to my favorite theory: that the blades of electric fans chop up oxygen molecules. Now, I’m just about the farthest thing from a physicist, but I am nonetheless pretty darn sure that the energy required to split apart oxygen molecules is higher than that generated by your typical household electric fan. Besides, all of these theories (and the many others I haven’t mentioned) also leave a couple interesting questions unanswered: Why do only sleeping people succumb to fan death? Why don’t wide awake people die as well? I’m glad to hear from you and very happy you’re enjoying the blog. I’m certainly having a lot of fun writing it! We’re doing very well over here. On the 21st, we’re heading up to Seoul and then on the 23rd, we’re off to our next country. I’ve also been following the news back home. Sure are a lot of slow news days over on your side of the Pacific, eh? I’ve heard the hypothermia theory before, and I’m open to the possibility that it may indeed be a fact. Who knows? That said, though, it is not enough to say something is a fact. We need some evidence. Are you aware of any peer-reviewed articles on electric-fan-induced hypothermia in sealed rooms on hot and humid nights? If you know of any, I’d be grateful for the link. Hey Jeff – loving the blog. The sturgeon-shark translation was priceless, and this posting was also hilarious. Hope you and the fam are doing well. Stuff here is, well, you know – stuff. Hi, jeff. How are things? I’ll call you soon,, actually next week… and hope to meet you and your littel monkey. Before then, let me give you an answer why death by electronic fans is true in Korea. In particular, in Korea!! In order to understand the fact, you should know the climate in Korea. Usually, summer in Korea is very hot and humid, especially during the daytimes not a dawn. Summer in Korea have reputation for its daily temperature difference . Widening gaps in the daily temperature, typical at this time of changing seasons, summer, are raising health concerns. Besides, you probably experience that temperature on your body is getting down when you sleep. People under the running fans show signs of hypothermia during night time. Sometimes it causes serious problem such as sudden death. You know hypothermia is very dangerous. It means not every people who under the runnign fans could die. Only person who is very unlucky can die with running fans during sleeping. For this reason, electronic fans have a time controller in Korea due to prevent an unfortunate accident. This is caused from not a belief, but a fact!! Scientific fact!! This is fantastic lol. It really makes me wonder where things like this originate. It must be. So what were you doing in Lome? Living there must have been a really cool experience. Peace Corps. I moved to the capital after 16 months in a village to work with Population Services International. I loved the heck out of my fan – no electricity in the village. I slept with a fan on almost every night when I lived in Togo’s capital and survived. Maybe fan death is only a threat in South Korea, though.